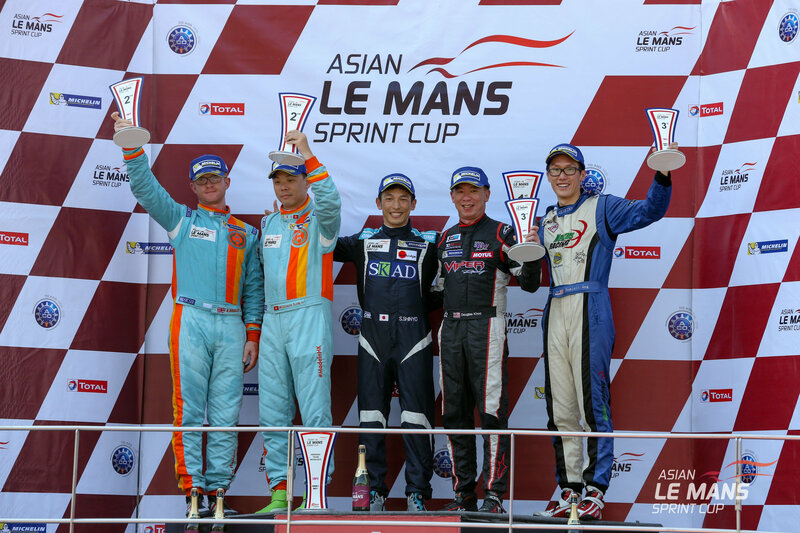 TKS Claims first Asian Le Mans Sprint Cup Race Win! 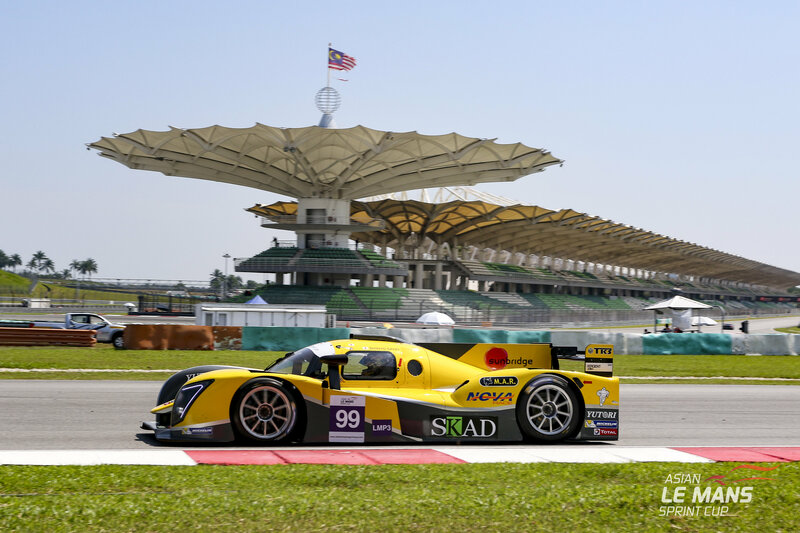 Shinyo Sano has claimed victory for Japanese team TKS in his Ginetta LMP3 in Race 1 of the second round of the Asian Le Mans Sprint Cup today. He also claimed Pole Position.The win however, did not come easy, with the hour long race around the Sepang International Circuit delivering plenty of action. The first qualifying session was tightly contested with less than a tenth separating Sano and WIN Motorsport’s William Lok. In third was Kurt Hill in the Eurasia Motorsports Ligier JS 53-EVO. 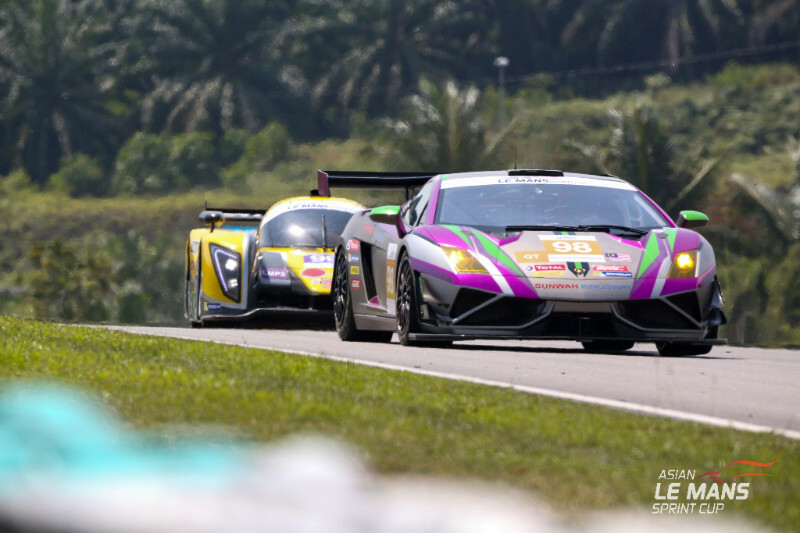 Leading the way in the GT class was Arrows Racing and their Lamborghini Gallardo GT3 driven by Marco Jacoboni. 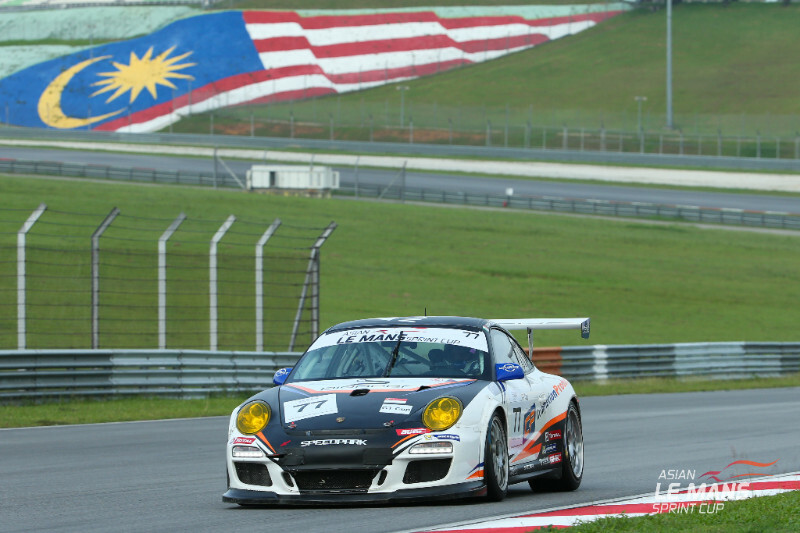 In GT Cup, Graeme Dowsett set the fastest time in the Team NZ Porsche 997 GT3 Cup. It was a tough morning for the LMP3 entry from Infinity Racing Engineering. A problem during qualifying saw them pull their car into the garage, incurring a penalty that will see them start both races this round at the rear of the field. At the start of the race, Jacoboni got an excellent start in the #98 Lamborghini and took the lead going into turn one. Unfortunately it turned out to be too good, and he received a penalty for jumping the start. Behind him the racing was close between the LMP3s of Lok and Sano. They were quickly joined by the Infinity Racing Engineering entry of Dominic Ang who stormed through the field from the rear of the grid to be up to third in the opening laps. By the end of the third lap he had taken the lead of the race. At this point in the race there were three different LMP3 manufacturers filling the top three positions on the track. Ang was behind the wheel of an ADESS 03, Sano in the Ginetta LMP3, and Lok in the Ligier JSP3. Behind the Prototype battle, the racing was tight in the GT Class with a three way battle of wheel to wheel action with the Team AAI BMW Z4 of Chi Huang, Graeme Dowsett in the Team NZ Porsche 997 GT3 Cup, and a hard charging Jacoboni in the Lamborghini. On lap 5 Lok and Jacoboni touched – sending both spinning and forcing Lok to pit. In a decision that was to have an impact on the race result, the stewards deemed the accident to have been caused by Lok, and gave the team a drive though penalty. After a short pit stop to check the damage to his Ligier JSP3, Lok came back on track and was quickly setting fastest laps as he chased down the pack. On his out lap after serving his compulsory pit stop, Kurt Hill in the CN went off at turn 4, hitting the barriers hard. He was able to get out of the car on his own, but went to the medical centre for a quick check up. He was given the all clear shortly after, slightly bruised but otherwise fine. The accident brought out the safety car so the marshals could safely remove the car. Behind the safety car, the order out front was Douglas Khoo, who had taken the wheel of the Infinity Racing Engineering LMP3, followed by Sano in the Ginetta LMP3, and Michael Choi in the Arrows Racing Lamborghini having taken over from Jacoboni during their pit stop. Nick Foster was leading the GT Cup Class in the Team NZ Porsche. The safety car came in with just over 10 minutes left on the clock. With the pack bunched up it promised to be an exciting run to the end – and the race delivered! Davide Rizzo was sitting in 4th place when the lights went out, but he was on a charge! Khoo was slow to get away at the restart and it was quickly a battle for the lead between the TKS Ginetta and Rizzo. Just as Rizzo took the lead, the drive through penalty for the earlier collision was given, forcing him to pit and drop back. He did not give up though and was able to fight back to finish in second place. Behind him, Choi was fighting hard with Khoo, with the Lamborghini driver passing the ADESS 03 to take 3rd overall and first in his Class. Team AAI came home second with Ollie Millroy behind the wheel of the BMW Z4 GT3. For the BMW, their run was hampered by the safety car coming out at the worst time for them, cutting short any further challenge. In the GT Cup Class Nick Foster took the win for Team NZ. Finishing in front of them all though, it was Japanese driver, Shinyo Sano who withstood the pressure from all around him throughout the whole race to claim the victory – his first in the Asian Le Mans Sprint Cup and his first win behind the wheel of the TKS Ginetta. Race Two starts at 12:55 on Sunday. The race will be streamed live on the Asian Le Mans Sprint Cup Facebook page, with live timing also available on our website. Thank you very much! I started in Pole Position but on the start the GT car passed because he got a good slipstream I think. During the race, the temperature is very hot, but I am very happy because this is the first time that I have the number one, it is the first time I have won. So thank you very much to everyone. We started the race and the GT car jumped the start and got through on us.Dominic came right behind me and also passed me. We were in a really tight battle, stuck behind the GT car. My engine gets very hot when we are running so close behind three cars, especially in the heat we have here which wasn’t good! Unfortunately there was an incident when I tried to pass Shinyo and the GT car tried to come through as well. Unfortunately we touched and turned into a penalty which I do not understand totally yet, but I am sure there is a good explanation. But after the incident I drove at the best I could, pushing and pushing. Then I handed the car to my team mate Davide. He really, really put on a great show given the position we were in and the situation. Anyway there is another race tomorrow and I had a lot of fun today with Shinyo and I am sure we will continue with this tomorrow! The race start was ok and then we know what happened. For my stint, it was really exciting; I had a lot of fun! I have to say that all of the guys I passed on my way were very respectful on the track, and I was able to get into first position again, but then we got the drive through. Not much we could do but we tried hard to push back again but there was just two laps to go when we rejoined. I have to say that was the most challenging race I have ever had! We had issues with the car in qualifying so we were quiet happy that the car could start the race at all. So the goal was to get up to the front again as quickly as we could. The start was good – I think I managed to pass four cars by turn one! Once I got to the front I just tried to pull as big a gap as possible before I handed the car over to Douglas. My race was really interesting – it was my first time in an LMP3 so it was a totally different speed and a totally different car to adapt to. But it was interesting! All I wanted to do was keep the car on the track and then when the safety car came out I thought this isn’t going to be nice with all the fast guys now right behind me! Anyway we managed to keep the car on the track and finish in 3rd so we are happy with that! First time for me in a Lamborghini and first time for me at Sepang. I think I jumped a little bit at the start but I’m not sure, I could not see the CN as it is so low beside me. But I tried to do my best for Mike – he also did very well, he made no mistakes! I had a car hit me – and push me hard – so I jumped hard. I don’t think there was too much damage, we will have to see. But it is really nice to be here with you all! Marco did a great job for me. When I got the car from him I just followed everybody until the safety car came out and it was possible for me to get close to the LMP3 cars in front of me. In the last three laps I had the chance to pass one, which was a very good experience – it was great fun! First I’d like to thank everyone that has helped us try and fix the issue we have – everyone from Infinity Racing, Arrows, guys in Carrera Cup Asia, Carrera Cup Australia, so many people! We have been chasing a problem with the car for the last two days. We thought we had it sorted yesterday morning, but it’s come back today – not as bad as it was, but it is still there so we are just going to have to wait and see what tomorrow brings for us. For the race our aim was really to pull away from the PAS car, we managed to also get in front of the BMW and pulled a bit of a gap. Then I handed the car over to Nick. I think he really showed just what that car can do – going around the outside of turn three on one of the LMP3s! He drove excellently until the problem started to come back. We are still having a load of fun – we are really lucky, very lucky in fact, to finish the race today. I had great fun out there fighting with the LMP3s! Unfortunately, the problem that we have been battling all week reappeared towards the end of the race, but I am still really pleased to bring the car home first in Class for Graeme and Team NZ!